Net Neutrality is technically dead. The regulation that forced carriers to treat all content the same was killed by the Trump-era FCC led by its president Ajit Pai. And while a vote by the Office of Management and Budget is all that is needed before your carrier can start discriminating how it disseminates content, there is a last chance movement brewing in Washington that could save Net Neutrality. Still, it is a longshot. Under the Congressional Review Act, a regulation approved by a governmental agency can be overruled by Congress. A resolution to override the regulation must make it through the House and Senate and signed by the president. There is a time limit as the resolution must be passed no later than 60 legislative days after the enactment of the regulation. A legislative day is one when Congress is in session. As we alluded to back in January, the Senate has the best chance of passing the resolution. All 49 Democrats will vote for it and one Republican (Maine's Susan Collins) will cross the aisle. But a 50-50 deadlock will only result in a tie breaking vote by vice president Mike Pence, and you don't need a Magic 8 Ball to know how he will vote. Thanks to a rule that has been used by the Democrats, the resolution does not need to get out of committee. A list of Senators supporting the resolution can be seen in the image at the top of this story. After a debate, there will be a vote next week; if the resolution passes, it will move on to the House where it probably won't find much support among Republicans. And if a miracle should happen and the resolution to eliminate the falsely named "Restoring Internet Freedom Order" passes both the Senate and the House, it still would most likely be vetoed by President Donald J. Trump. Of course, the House and Senate could override a presidential veto, but that would require a vote in favor of returning net neutrality to be cast by two-thirds of the members in each chamber. Stranger things have happened. Ask Minnesota Viking fans who witnessed their team pull off a last-second miracle in this past year's NFL playoffs. But that seems like child's play compared to what fans of net neutrality need to happen in order to keep the regulation alive. It’s a shame net neutrality is likely going away. We need internet freedom, not throttling and prioritization. ISPs shouldn’t have that much power. All we can hope for is that some carries and Internet providers will remain neutral, some have already said they would even if net neutrality is gone. Most likely no carrier will throttle, or anything of the sort. Costumers would simply switch carriers. Much like Music Services (Spotify, amazon music, etc..), they all have the same payment plans and deals because they agreed upon it as a collective, or else they would keep having to compete with one another. Say MetroPCS starts throttling and slowing speeds down, customers would simply switch to another carrier. So, most likely no carrier will do anything bad, and if they do they will lose consumers. No thanks, let net neutrality die damnt! We dont need government to control our like out tv, radio, and cellular already are! oh, so you'd rather have your isp choose which sites you can access? some of which will now have separate fees? You clearly have no idea what net neutrality is. I hope you are being sarcastic but do you even know what net neutrality does? It prevents anyone from prioritizing the data that is sent and received through your network provider. This means that the current repeal by the FCC will allow companies and the government to control what you can see and can´t see. It is literally the opposite of what you think. There's no way it'll pass with a veto proof majority, and the third grader in Chief will veto it just because it was an Obama accomplishment. States need to pass even more aggressive net neutrality laws to make the ISPs wish they had stuck with a single national requirement. Then when the US kicks Republicans to the curb we can reinstate this critical protection that affects all Americans. For the record Net Neutrality is more necessary and benefits Americans more than the second amendment ever has. We would still have guns without the 2nd, less of them and more rules, but both of those things would protect Americans more than guns ever have. And I grew up a farm boy with a gun. So lets be honest for once about both of these topics. Do these politicians really speak for what the public wants? 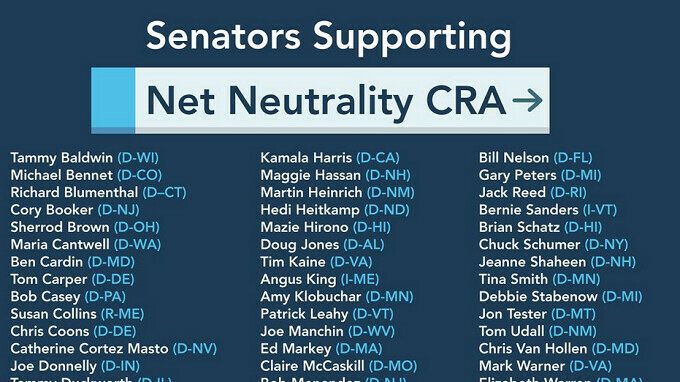 Since this affects all of America, a public referendum to restore net neutrality should be in order. They are merely fighting in congress, GOP vs. Dems, and they have left the welfare of the people alone which is what should really matter. Assholes come and go, ajit pai is no different.